22 November 2016, at 12:00a.m. The 2016 Nutriad Mycotoxin Survey included 73 wheat and 32 triticale samples collected across Poland. All samples were collected either directly from the farms or from animal feed production sites. Sample providers followed the principles of good sampling (Richard, 2000). The analytical personnel and laboratory staff were not involved in sampling and, therefore, did not influence any part of this procedure. 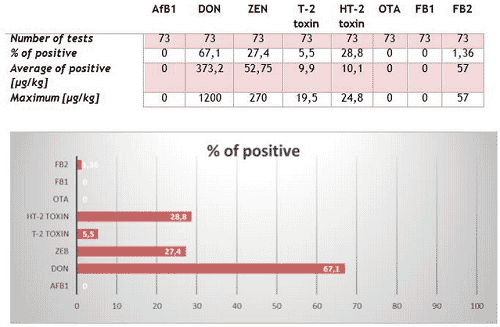 The survey provided an insight into the incidences of aflatoxin B1 (AfB1), zearalenone (ZEN), deoxynivalenol (DON), T-2 toxin, HT-2 toxin, fumonisin B1 (FB1), fumonisin B2 (FB2) and ochratoxin A (OTA) across all regions of Poland. More than 800 analyses were conducted to test for the presence of the 8 mycotoxins most frequently found in agricultural commodities that are intended for animal feed production. All 8 mycotoxins were analyzed by liquid chromatography tandem mass spectrometry (LC MS/MS). For the purpose of data analysis, non-detection levels were based on the limits of quantification (LOQ) of the test method for each mycotoxin: AfB1 < 0.5 μg/kg; ZEN < 10 μg/kg; DON < 75 μg/kg; FB1 < 125 μg/kg; FB1 < 50 μg/kg; OTA < 1 μg/kg; HT2-toxin< 4 μg/kg and T-2 toxin < 4 μg/kg. The results from the Nutriad survey showed that almost 70% of the wheat samples were contaminated with DON and 30% with ZEN and HT2-toxin. As expected none of the wheat or triticale samples contained AfB1. Surprisingly almost 20% of the samples of triticale were contaminated with FB2, a typical maize mycotoxin. Most of the recovered mycotoxins were in concentrations regarded as medium (>LOD but below EU recommendation levels). The highest concentration of DON and ZEN found in the wheat reached 1200 μg/kg and 270 μg/kg respectively. Interestingly, 6% of the triticale samples contained OTA while none of the wheat samples were contaminated with OTA, a known typical storage mycotoxin. None of the samples of wheat or triticale were contaminated with FB1, also a typical maize mycotoxin (Table 1 and Table 2). The wheat and triticale mycotoxin survey conducted by Nutriad in 2016 concluded that this year’s harvest of wheat and triticale in Poland is of concerning quality in terms of mycotoxin contamination. Based on the results of this survey, it is the belief that this year’s wheat and triticale crop should not be considered safe for inclusion into finished feed rations for all animal species. Wheat and triticale in animal feeds originates from many sources and vigilance is always advisable. Wheat, triticale, barley and oats harvested in 2016 across Europe have been shown to be contaminated with medium concentrations of mycotoxins. The last possible line of defense is the detoxification of mycotoxins in vivo. The addition of proven mycotoxin deactivators to animal feeds is a very common method to prevent mycotoxicosis and is an effective strategy to keep the risk of mycotoxin contamination low under any and all conditions.